I shared my projects with the Studio Calico August kits in my last post, and I have one more card to share today. The squints add-on has such pretty flower stamps, and such lovely patterned papers! This card is all about color... I did some stamping and some coloring with my neocolor watercolor crayons for a bright and happy look. 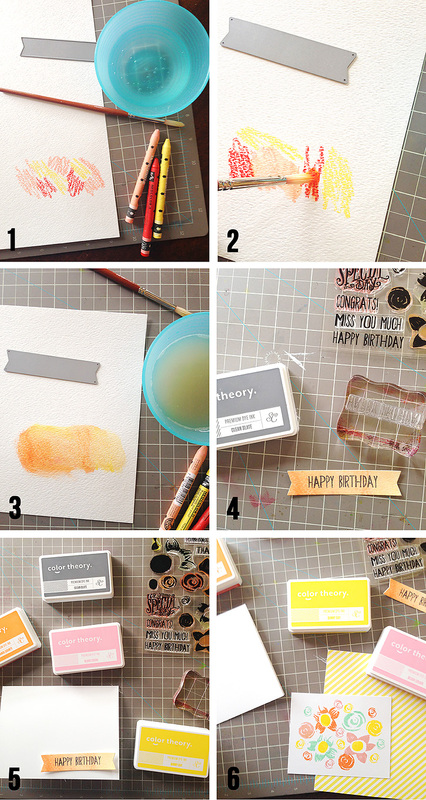 Here's a step by step look at how my card came together. Color three different neocolors (salmon, vermillion, naples yellow) in a random pattern large enough to cut out a banner shape. Watercolor paper works best, but you could also use cardstock. Use a slightly wet paintbrush to blend the colors. Blot the paintbrush on paper towels because you don't want it to be too wet. Cut out a banner shape from the painted area. I used a die, or you can cut by hand. Stamp your sentiment on the banner. I used color theory clean slate. I used a card base of 5.25x4.25 inches, a piece of white cardstock about 4.5x3.5 inches (I don't alway measure - sometimes I just eyeball it), and patterned paper at 5.25x4.25 inches. Stamp flowers on white cardstock. I used color theory blush crush, orange county, mint hint and sunny day. To assemble your card, adhere the patterned paper to the base. 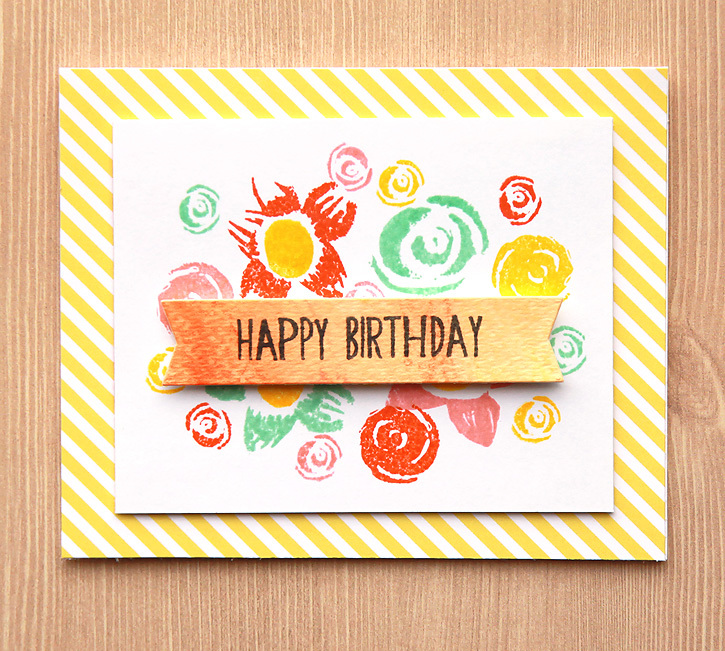 Use dimensional adhesive to adhere the stamped flowers and banner and you're done! 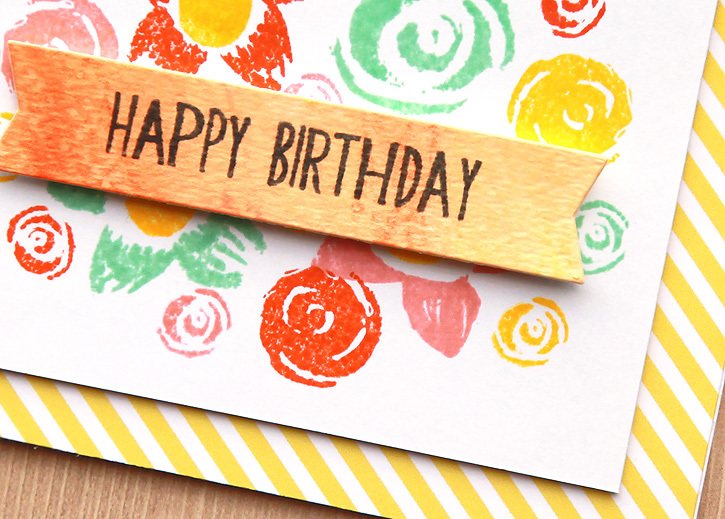 Check out the Studio Calico creative team card gallery for lots more inspiration with the Sandlot card kits! free kit at studio calico!